Indian names: manmjedi (Andhra Pradesh); khemri, pheru (Dehradun); pepri (Gujrat); phegra. fagura, khasra, daghla anjir (Himachal Pradesh); abjiri, bedu, khemri (Hindi); pheru (Jaunsar); bedu(Kumaun); phegwara, phagoru, fagu, anjir (Punjab). 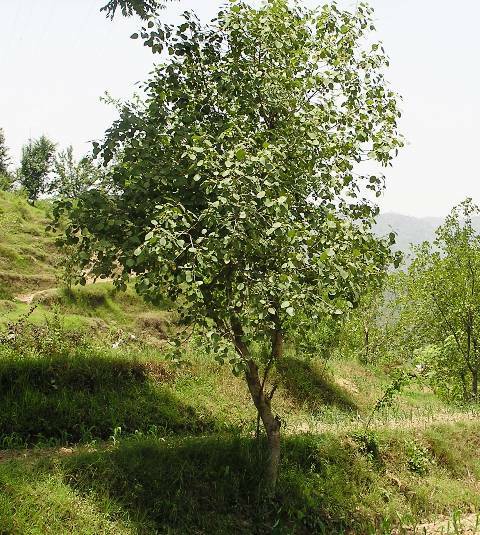 Fegra is one of the tastiest fruits found growing wild in the mid-Himalayan region. It is on a par with the cultivated figs in taste and flavour, however, size is rather small in this case. Fegra plants are of very common occurrence at places up to 1,550 metres above the sea-level. These trees are rarely found in the forests, but grow around the villages, in wastelands, fields, etc. The fruits are liked very much by the people. They are also offered for sale. A deciduous, moderate-sized tree, 6 to 10 metres in height; young branches, tomentose, often becoming glabrous; bark, smooth, dull, ash gray, can be stripped off with the hand, exposing the white to light-yellow wood underneath; wood, moderately hard. Leaves, alternate, broad, ovate, membranous, 12.92 cm long, 14.16 cm broad, having reticulate pinnate venation and dentate margin; dark green and rough on the upper surface, light green and tomentose on the lower surface. Flowers, unisexual, cyclic, greenish white, very small; the fleshy receptacle forms a hollow cavity, with an apical opening, guarded by scales, and the flowers are borne on the inner walls of the cavity; both the male and female flowers are present within the same receptacle; the male flowers generally develop at the apical pore, whereas the female flowers develop towards the base of the receptacle; the sepals and petals are modified into scales, and are mostly four; ovary, ovoid, smooth, having a very short style; receptacle, axillary, more or less globose. Fruit, syconoid, developing from the hollow, globose, fleshy receptacle, average diameter 2.58 cm, weight, 6.08 g, volume, 5.94 ml, colour varying from deep violet to black; colour of the juice, tyran rose 24. Flowering starts from March and continues up to the end of April. 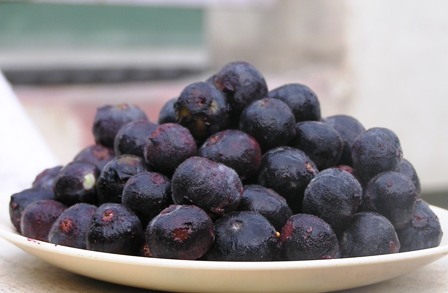 The fruiting season starts from the second fortnight of June and continues till the first half of July. 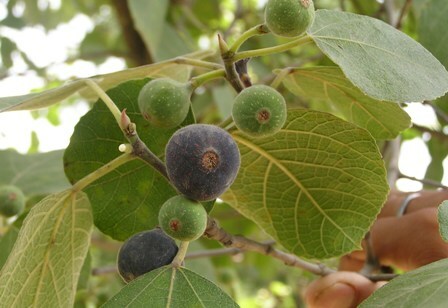 A full-grown wild fig-tree yields about 25 kg of ripe fruits during one season. The fruits are juicy, containing 45.2 per cent extractable juice and 80.5 per cent moisture. The total content of soluble solids of the juice is 12.1 per cent. The fruit-juice contains acidity to the extent of 0.71 per cent; total sugars, 5.98 per cent. Most of the sugars are in the form of reducing sugars. The pectin content of the fruit is 0.20 per cent. The fruits are, however, not rich source of vitamin C and contain only 3.35 mg of vitamin C per 100 g of pulp. The protein content of the fruit is 1.72 per cent, and the ash content is 0.924 per cent. Some of the mineral elements, viz. phosphorus, potassium, calcium, magnesium and iron, were found to be 0.034, 0.296, 0.071, 0.076 and 0.004 per cent respectively. The fruits of Ficus palmata Forsk. contain chiefly sugars and mucilage and, accordingly, act as a demulcent and laxative. 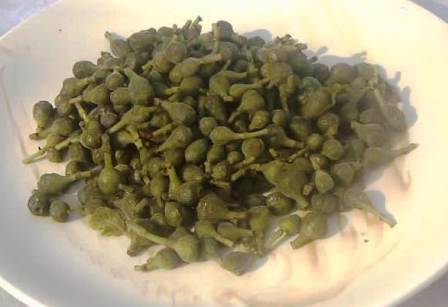 They are principally used as an item of diet in cases of constipation and in the diseases of the lungs and the bladder. They are also used as a poultice. The whole fruit, along with the seeds, is edible. It is sweet and juicy, having some astringency, which is due to the presence of white latex just beneath the epicarp. The astringency can be removed by keeping the fruits immersed in water for about 10 to 15 minutes before eating. The overall fruit quality is excellent. Fegra. is a very tasty fruit. It is very much liked by all. It is also offered for sale at certain places. The keeping quality of the fruit is not much and therefore it can be sold only in the local market. This fig is a very juicy fruit. Work should be taken on standardizing the techniques for making various products, such as squash, jam and jelly from this fruit. Dehydration, which is common in the case of cultivated figs, should be tried in this case also. The raw fruits, along with the new growth, are used as a vegetable by the villagers in the beginning of the spring. They are first boiled and then the water is removed by squeezing. They are then fried and a nice green vegetable is prepared from them. This fruit has a scope for cultivation and it should be extended. There exists considerable variation in the size and quality of the fruit among different trees. Good types should be selected for propagation.